Last night ANC MPs showed South Africa how far they were willing to go when others attempted to hold them to account. In the hours of bedlam, heckling, and howling the ANC managed to push South Africa’s democracy to the brink. The ANC not only voted to protect President Jacob Zuma, who according the Public Protector’s findings “unduly benefited” from taxpayers’ money, but it also called police clad in riot gear to rip a female Member of Parliament (MP) from the opposition benches. 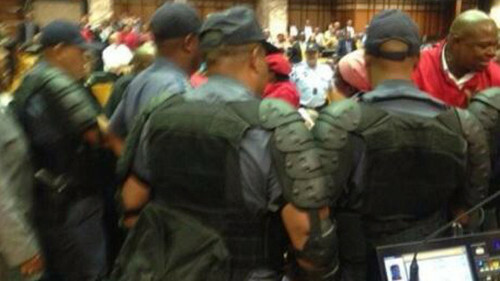 In the ensuing chaos, the riot police tackled Democratic Alliance (DA) MPs and caused damage to several of the benches and equipment in the National Assembly. This act of force is inexcusable and it is unacceptable. As Zuma visited learners in Soweto, his party apparatchiks at Luthuli House snapped their fingers and ordered their MPs to vote to protect him. The recent aggressive opposition in Parliament has left Zuma cowering away in another province, but it has also left the ANC desperate. Luthuli House no longer has a handle on how Parliament operates, its Speaker was chased out of her seat, and its members were left to deal with a mostly united front of opposition parties. The use of police to remove MPs who dared to fulfil their constitutional duty to hold the executive to account is merely an act of desperation. A desperate ANC, forced into the corner, and with an absent president, doesn’t know what to do anymore. When it couldn’t use its parliamentary majority to silence opposition MPs, it turned to racial epithets, and called in the force of the state police to remove the politicians who just wouldn’t let them protect Zuma in peace. The ANC’s public representatives have been reduced to the likes of Lindiwe Zulu, who allegedly had to be held back from physically assaulting an EFF MP. The party of Albert Luthuli and Nelson Mandela is now the party of bar brawls, and politicians who protect their big boss. Reduced to rubber-stamping party directives and policy, these lame-duck governing party MPs couldn’t handle the new threat to their mechanised assent to everything the Sugar Daddies above demand. So they called the police in. Although it is shocking that state-sanctioned violence should take place in the same hallways where the Constitution was finalised and assented to; state-sanctioned violence shouldn’t be unexpected from the same government that allowed the Marikana massacre to take place under its watch. Yesterday opposition MPs staged an intervention for the sake of our democracy. These public representatives spoke out against Sugar Daddies and their stranglehold over our polity and the way our public institutions work. These opposition MPs refused to collude in covering-up Nkandlagate, while hundreds of ANC MPs chose to listen to the Sugar Daddies who ply them with political power and patronage. Jacob Zuma’s MPs watched on as voting equipment and microphones were (symbolically) smashed by hulking officers. It wasn’t just an attempt to silence a few rogue opposition MPs. This was an attempt to protect Zuma at the expense of constitutional democracy and a Parliament that holds its executive accountable. When MPs were ripped from the benches of the National Assembly by police officers, all of our voices were silenced by the ANC. The IFP’s Liezl van der Merwe was forced to withdraw the statement calling ANC MPs “howlers”, after which she was heckled as an “umlungu”.